Hello ... Hello ... my old friends ... It's great to see you once again! The Trembling Wilburys made their now annual pilgrimage to The Roadhouse in the ELO heartland of Birmingham last night (Friday 17th March) and proceeded (again) to take those assembled (including Yours Truly KJS) on a journey through not only the Traveling Wilbury cuts we all know and love but also a selection of songs by Jeff Lynne/ELO, George Harrison/The Beatles, Bob Dylan and Tom Petty as well as a healthy roster of tunes by Roy Orbison. Musicians and bands who focus their attention on The Traveling Wilburys - the ultimate super group of them all - are few and far between. This fact alone makes The Trembling Wilburys both unique and appealing to the fans and followers of not only The Fab Five but also each individual Wilbury and their extensive careers across various genres. Thirty one (31) songs were performed yesterday evening in a gig that lasted well over two hours starting with a fantastic octet of classics by The Big O sung magnificently and accurately by Dave Collison. The remainder of the first set saw The Tremblers deliver stunning live reworkings such as "While My Guitar Gently Weeps", "Something", "I Won't Back Down", "If Not For You" and an almost skifflesque "Hold On Tight". Thereafter, we were treated a second set including twelve Wilbury tunes with "Runaway" and "Roll Over Beethoven" aptly wrapping things up. The four vocalists on show - Dave Collison, Marko Laver, Glen Knowler and Andy McNish - all do a magnificent job when they combine their talents with guitar wizard Dzal Martin, keys maestro Howard Robin and founding percussionist Dave Stark to reproduce these collected Wilbury works - and it was no different last night. Highlights for me (and there were a few) were undoubtedly (if not already mentioned) "Tweeter And The Monkey Man" (just how does Andy McNish remember all those lyrics? 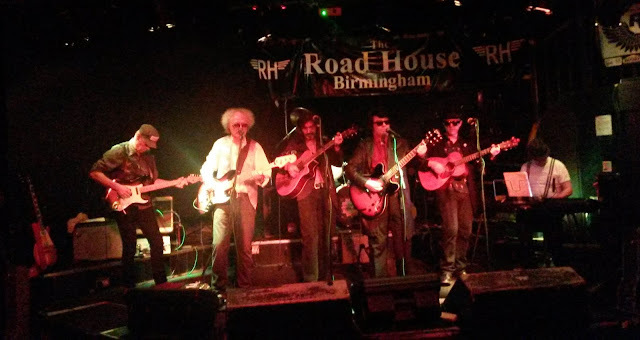 ), "Runaway" (acknowledging the contribution of Del Shannon), "Ooby Dooby" (Dzal's guitar solos were sublime all night but this one was memorable in its own right) and "Roll Over Beethoven" (merging the twin covers by ELO and The Beatles). Whilst I continue to be amazed by the physical and aural likenesses of Glen Knowler to George and Dave Collison as Roy Orbison, it was also nice to see and hear more of Marko Laver and Howard Robin on display not forgetting that the drum work of Dave Stark makes him a more than fitting Ringo Starr or Jim Keltner. 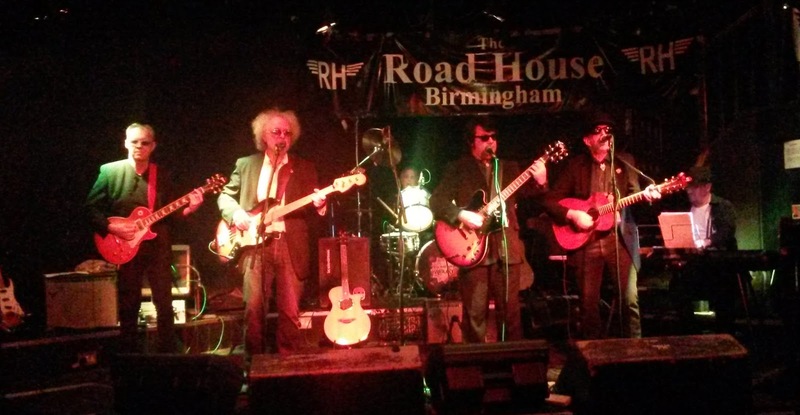 Indeed, if you want get an idea as to what a Wilburys concert might actually have sounded like, you should go see these guys yourself! 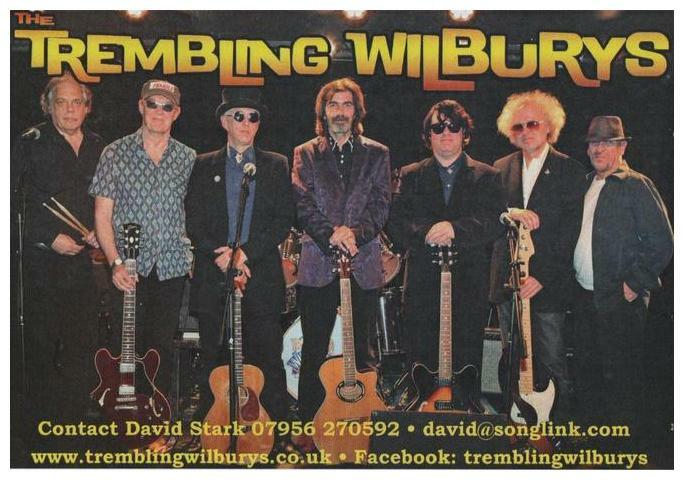 The Trembling Wilburys performed: "Only The Lonely" ~ "Claudette" ~ "Working For The Man" ~ "Crying" ~ "In Dreams" ~ "Running Scared" ~ "Ooby Dooby" ~ "Pretty Woman" ~ "If I Needed Someone" ~ "Here Comes The Sun" ~ "If Not For You" ~ "Hold On Tight" ~ "Something" ~ "I Won't Back Down" ~ "I'll Be Your Baby Tonight" ~ "While My Guitar Gently Weeps" ~ "You Got It" ~ "She's My Baby" ~ "Dirty World" ~ "Inside Out" ~ "Heading For The Light" ~ "Last Night" ~ "Rattled" ~ "Tweeter And The Monkey Man" ~ "Not Alone Anymore" ~ "Wilbury Twist" ~ "End Of The Line" ~ "Handle With Care" ~ "Runaway" ~ "Taxman" ~ "Roll Over Beethoven"
elobeatlesforever (elobf) recommends The Trembling Wilburys to those enlightened folks who enjoy the music of ELO, Jeff Lynne, The Traveling Wilburys, Roy Wood, The Move, The Idle Race, 'Brum Beat', The Beatles and related artistes.